This writeup shows how I got my Pogoplug and a TP-Link TL-WN821N V3 (or TP-Link TL-WN822n V2) to work together as a 802.11n Wireless Access Point. The steps here are reproducible (they have been tested several times), and this unit works well enough for me to use daily at my workplace as my wireless AP, day-in, day-out. As far as these instructions go, is an Access Point, not a router, brouter or anything else (it is not OpenWRT or TomatoUSB). It simply channels network connectivity from its wired ethernet port and makes that connection available to wireless clients, once a WPA passphrase is entered. Again, you can turn it into a router or brouter by adding iptables and/or ebtables, and a few other modifications. If this is not the case, then you may find it challenging to carry out the steps, or to understand what is being said. You have been warned. It could brick your Pogoplug, clog your sink, flatten your tires, wreck your life, motivate you to beg others to google stuff for you, and cause you to generally be a miserable person. Well, that didn't happen to me - my access point works great, and I didn't have any problems - I'm satisfied with it. But, then again, YMMV. Good luck. 2. Install Debian Squeeze on your Dockstar's USB drive and then upgrade your kernel to make sure you are running a 3.3.x kernel. and you should see that you are running a 3.3.2 kernel. Ideally, you want a 3.x.x kernel, since the driver for the ath9k usb adapters works very well. Some of the pre3.0 kernels had problems w/ the driver for the chipset we want to use. You could do this w/ an older kernel and modules, but with the new kernel working so well, seems like a less efficient choice. Also, you'll probably need to pull in cdra and wireless-regdb from Squeeze-Backports. Also install the firmware-atheros package. Since this package is in non-free, you must either edit your /etc/apt/sources.list to access the non-free packages, or simply download it from here : http://ftp.us.debian.org/debian/pool/non-free/f/firmware-nonfree/firmware-atheros_0.34_all.deb and install it via dpkg -i.
then copy the contents below into the file. Make sure you chose a wpa_passphrase. You can change the ssid to your liking. #  this enables the 802.11n speeds and capabilities ...  You will also need to enable WMM for full HT functionality. b. Disable the regular startup of hostapd via the init script in /etc/init.d/hostapd, so that it will be started up just after br0 is brought up. The easiest way do this is to move it to /. c. Set up your /etc/network/interfaces: Move the stock file to a backup name, and then create a new file, copying in the contents below and saving it. You will have to adjust the contents below somewhat to fit your own network, your router's (gateway) address, and the addresses that you want to use for eth0, br0 and wlan0. The file contents below are commented, but it is assumed that you have a good working knowledge of this sort of thing. ###  	      may decided to try to change that and have one or more of them set dynamically. YMMV. ###		      The IP ranges show are generic : change them to fit your network. d. Edit /etc/resolv.conf to point to your nameserver (dns server). This may be optional for you - I didn't have to. Determine that you can ssh back into your pogoplug/dockstar. Using a laptop, iPhone, or other wireless client, you should also be able to connect wirelessly now, as well, using the wpa_passphrase that you entered. a. Survey your local 2.4 GHz (or if applicable, 5 GHz) environment. Use an application like iStumbler or Stumbler, accumulating samples for at least 15 minutes, as often/frequently as your software allows you to (mine allowed sampling every 10 seconds), from both inside your house and (if possible) outside. You want to know how many of the channels are occupied in your area. Determine the least-used, least-crowded channel(s). This is NOT an optional step if you want optimum performance. Once you choose a "clear channel" for yourself, edit /etc/hostapd/hostapd.conf to reflect your new channel choice. 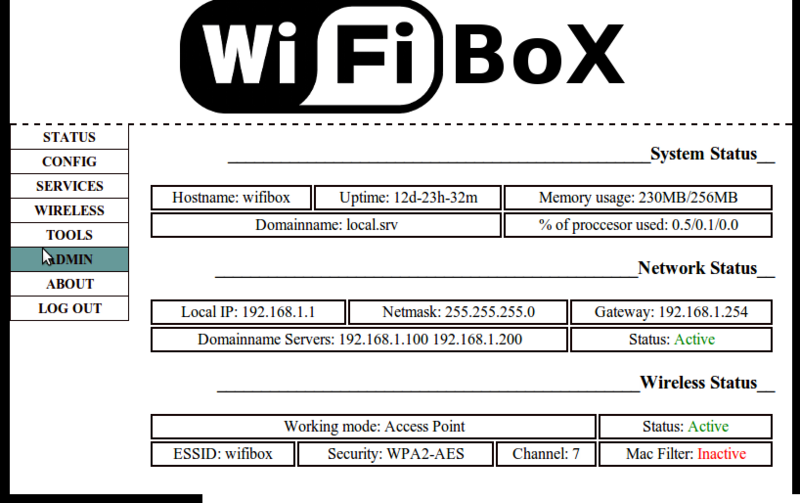 (note the iwconfig wlan0 txpower 12 in the post-up line. 8. Finish up odds-and-ends, add packages to your liking, and for you needs. set /etc/hostname to something more descriptive than "debian"
set the root password to something other than "root"
optional: add samba & swat, netatalk, and avahi-daemon so that your AP can function as a NAS device, in addition. After some tinkering on a Pogoplug E02 and a TP-Link Wn-N821 V3 card, I've managed to get this far in Wheezy: Using the 3.1.0-1-kirkwood kernel, wireless-tools, dhcp3, and other bits and pieces, it boots, creates and configures wlan0 as the wireless interface, brings up hostapd & the interface in master mode, invites my Mac Airbook to associate w/ it, and it issues a dhcp lease. I confirm that the lease is written to the lease file on the AP. Also the Mac Airbook shows the leased dhcp IP. Unfortunately, something w/ routing is borked, I think, as I can't ping anything on the other side, from either side... seemingly no connectivity... I cannot ping the AP (neither eth0 nor wlan0) from the Airbook, nor the other way around. NOTE/EDIT: I've found that if I connect two wireless client to the AP, I can access them from each other. I confirmed that with my iPhone and MacBook air. Edited 64 time(s). Last edit at 08/24/2012 05:35PM by davygravy. and a range to give ip's; example: 192.168.1.10 192.168.1.20. If you don't specify domain-name-servers on the dhcp server configuration file you will need to set your local server as dns server with (for example) dnsmasq. Dnsmasq only read /etc/resolv.conf on your host and provide this info to your clients. Edited 3 time(s). Last edit at 11/28/2011 04:30PM by davygravy. Edited 1 time(s). Last edit at 11/28/2011 04:25PM by davygravy. EDIT: Now have solved a DNS problem and can wirelessly ssh into my AP via either interface's IP, and can access the internet from there (from the AP). Now just need to pass that connectivity directly along to attached wireless clients. EDIT2: Getting closer: I just have to come up w/ a nice, clear way to use iptables to move everything back and forth between eth0 and wlan0. Edited 4 time(s). Last edit at 11/28/2011 11:57PM by davygravy. PING yahoo.com (72.30.2.43) 56(84) bytes of data. One issue is that the use of the ath9k chipset & driver w/ hostapd forces one to have to handle the br0 bridge interface in a special way, distinct and different from the other wireless cards. :^| ... still working at this... an irritating point of difference between this author's setup and mine is that he _has a built-in LCD/LED screen on his AP host_. My box doesn't. So if during the experimentation, one borks the network setup, there is no soft landing - you have to force a hard restart of the pogoplug, since your only window into it is via ethernet. EDIT 2 : Success! at least a partial success... using the steps from the article above http://www.su-root.eu/computing/turn-your-linux-computer-in-a-wireless-access-point-using-hostapd I put script together that creates the bridge and brings it up as an interface. It is _truly_ a bridge, as the IP that my laptop receives is from my router, not from the subnet that is handled dhcp-wise on the AP. Something to be fixed is one pesky problem - when the bridge br0 interface is up, I can no longer contact the AP via ping, ssh or anything else. This certainly won't work. Maybe some routing or iptables stuff to fix still. I think I know why this is, and i think it will be easy to fix. Not so easy, and I didn't understand after all as much as I thought I did. Good stuff: the AP is fast, responsive and stable. What I still have to work on is some way to have access to eth0 while the bridge is up. Edited 11 time(s). Last edit at 11/30/2011 09:54PM by davygravy. OK, I guess I have to surrender to hostapd, br0 and whatever else is conspiring against me. After 2 days of tinkering I cannot find a way to raise br0 (the bridge interface) and tap into it for ssh access (or other access) to the AP. The AP works great - on par w/ my RT-N16 router, in terms of connection strength, stability, etc... but I can't access the AP machine itself - just its very nice bridge interface br0... so my terms of surrender involve the purchase of a cheap $3 (USD) USB-to-Ethernet adapter. I will use it to get access to the AP via the eth1 that it will provide (a second wired ethernet interface/port). This can be either a permanent solution, or a way into the box until I can figure a way out to access the AP via br0. Edited 1 time(s). Last edit at 12/01/2011 07:42PM by davygravy. The Wireless AP works as DHCP server (with isc-dhcp-server) and DNS forwarder (dnsmasq) while the DSL router works as internet connection and dynamic dns client. Hostapd works great instead of my 333Mhz Via proccesor & 64MB ram; if you want I can post here my /etc/network/interfaces. and yes, could you please post your /etc/network/interfaces ? @ pazos: Good news for me... I decided to disregard what the documentation regarding hostapd & ath9k-usb units says, and just made standard bridge in /etc/network/interfaces... and boom, it works. I think that the only remaining problem may be making sure that br0 has a connection to the internet. The bridging function works well - my laptop and iPhone connect just as they should, and access to the internet for them is fine. Edited 3 time(s). Last edit at 12/02/2011 10:05PM by davygravy. Boots, raises br0, starts hostapd, adds in necessary route for br0 to have access to internet. WPA-PSK works fine, speeds are the maximum our laptops can reach... I'm satisfied with it. Once I get some time over the next week or 2 I'll clean up any cruft, and post reproducible steps for it. I'd eventually like to attach a USB-sata2.5inch disk to it instead of the USB pendrive- more durable than the flash drive and can serve as NAS space, and also install p910nd on it so I can use it as a print server. Of course play is better than buy, and funnier too! In terms of function, it is a Time Capsule/Wireless-NAS device & printserver, with good Apple, Windows and Linux support. Its wireless signal (at first look) seems to be about 85%-95% of the signal from my Asus RT-N16 (which was the creme-de-la-creme a year or 2 ago). True, it doesn't have a great webif, but I don't need that. > source code from monowall). @pazos, it sounds very interesting! any chance you have something to share with us? I'm using webmin, but the sw is just too much for non-tech users to navigate. I gave some of my Debian-based plugs to my relatives as gift, and they would rather have a simple interface that only allows shutdown, print spoolers, file sharing and such point-and-click stuff. I might have to learn CGI! Thanks pazos! that looks really nice. >how much work this kind of thing is? Edited 2 time(s). Last edit at 12/15/2011 07:50PM by pazos. Has anyone actually tested the wireless transfer rate of a TP-Link TL-WN821N V3 , TP-Link TL-WN822n V2 or any USB wireless adapter that is capable of being used with a pogoplug/dockstar device as an AP? I have a TP-Link TL-WN822n V2, which I use in conjunction with a dockstar as an access point, and am unable to achieve a transfer speed above 0.5Mbps (megabits per second) when transferring between wired and wireless Windows 7 machines. When I use my standard 54Mbps wireless access point the transfer speed is approximately 26Mbps. My hostapd.conf file is more or less identical to davygravy's: I use solely WPA2 AND CCMP encryption. My kernel is a self-compiled 3.1.5. Edited 1 time(s). Last edit at 12/19/2011 10:34PM by davygravy. Thanks for all you work Davy; it is much appreciated. I've managed to solve the file transfer problem: the WN822n V2 now transfers files faster than my standard 54Mps AP. My problem was that I had not used crda to set the country_code for the WN822n V2. crda is not an optional extra; it must be used to set the country code for ANY USB wireless adapter: otherwise the wireless adaper will not perform to its true potential. @ Kalli Pidgeon: your question got me thinking... and I dug into some things with more scrutiny and skepticism... and it seems to have paid off (and it retaught me the lesson of not assuming things that are posted as fact on the web, even though they may sound authoritative...). Right now the best I can get from my AP is about 6-7 MB/sec read and write. I don't know if I can push it up to equal performance w/ my RT-N16/TomatoUSB router, but I'll try and post results here, showing what hostapd.conf settings gave. My reading led me to try to disable HT40, and go with just HT20, and that _has_ panned out positively, moving me from about 2MB/sec to better than 3 times that. I'll post back here as I get more results. I was shocked to see just how much chatter and traffic there was in the 2.4GHz band around our neighborhood. I counted 21 cells around us, mostly on channels 1, 4, 6 and 9. The only unoccupied channels are 2, 5, 7 and 10. To profile the 2.4GHz environment surrounding our home, I did the following. I started up iStumbler on my (psuedo) Mac AirBook, and slowly walked around the house (outside), making sure I had it set to remember stations for an hour, and to scan every 10 seconds. Then I let the program run for another 20 minutes, with it just sitting in an upstairs room. Choosing a channel that has __no__ traffic makes a huge difference. I also found that running the chip/USB adapter at full power (default) seems to allow it to become unstable and suddenly stop working. My theory is that it is overheating - I notice the crash and dropout when I'm testing it w/ 1GB files. If I cut the power back to 50% to 70%, these drop outs seem to stop completely and the card is much stabler. for instance, to set it to 70% or 14/20 dBm. I currently have mine set at 50%, but this covers my house well, and gives me a decent signal outside on the porch, on the patio or at the picnic table in the back yard. This may vary by manufacturer - perhaps some makers put a good heatsink on their units - it is my guess that TP-Link didn't expect users to use them as AP interfaces... but I don't know for sure. Edited 5 time(s). Last edit at 12/22/2011 10:50PM by davygravy. Finally found the sweet spot - the right settings so that my AP's performance is at least close to that of my Asus RT-N16 ... phew. I've changed the How-To to reflect my findings and fixes for some problems w/ speed and performance. The first rate of 130MBits/sec is from my MacBook Air... and the second is from a g-device, my iPhone. While it is nice to see these rates, it is better to actually experience them, by doing transfers of large files. Such transfers give me about 85MBits/sec, typically, on the Airbook. Edited 1 time(s). Last edit at 12/22/2011 11:56PM by davygravy. @davygravy, just wanted to say THANK YOU! for posting this tutorial. I followed the Dec 23-11 version of the tutorial and can confirm that it works with a Pogoplug V2 (Pink) and the TP-Link TL-WN821N V2. 1. Any tips for adding a second wifi adapter to use in client mode? I'd like to have my Pogostick connect to my gateway router wirelessly. 2. What exactly is a (psuedo) Mac AirBook? I'm assuming it's a hackintosh of some sort...? Edited 1 time(s). Last edit at 12/23/2011 08:18AM by MediaMind. Yes you should be able to use a second USB stick as a client. Just thinking out loud here, not sure what the best choice as chipset would be, I'd definitely go with 802.11n to minimize lag/latency. You'll have to set up a new section in /etc/network/interfaces that passes along the passphrase to you wireless network. Definitely post back with your results, as someone will no doubt find it interesting. Btw, I'm not sure whether it will simplify or complicate things to have the same chipset in your 2nd USB stick. If they are different, you may have to do something w/ udev in order to make sure the correct one gets mapped to AP usage. Let's us know how you solution takes shape. And yes, my little laptop that could is a Dell Mini 10v triple-boot, w/ 6 cell battery and a wireless n pcie card. Works like a charm. ... but ... today I decided to do an apt-get upgrade on my Wheezy install, and in pulled in a number of new packages... hostapd among them... and I've been running at full txpower for 24 hours, transferring about 150GB of files, back and forth and no hiccups... I'll keep stress-testiing it a bit more. OK, now w/ 2 weeks of testing, and nary a hiccup... this is now my main wireless AP at home and at work. Edited 2 time(s). Last edit at 01/08/2012 06:27PM by davygravy. I am unable to have the dist-upgrade go right. Every thing seems to work ok, but the system never comes backup. I do not own a serial cable yet so all the information i have is that it installes the 3.2.0-1-kirkwood and then when it reboots the led never lights and only the ethernet blinks. I am just wondering if you are having any issues with it as i see there are problems with the 3.2 and up kernels when you guys go to compile them. Edited 1 time(s). Last edit at 02/12/2012 11:52AM by leapole. Yes, there is a problem w/ the Wheezy kernel that is in testing. It will not boot on many/most kirkwood machines. You may want to try to install Squeeze as the original, and then use my kernel here: http://forum.doozan.com/read.php?2,6578 towards the bottom I have links up for a 3.1.9 kernel I am running on one of my two AP's. Edited 1 time(s). Last edit at 02/12/2012 01:26PM by davygravy. Thank You for the Info - I am going to stop trying to get wheezy to boot for now. I have installed your kernel 3.1.9. It works and everything boots but It does not see my tl-link 722n wifi chipset. I have installed the firmware-atheros and everything looks great in the lsusb and lsmod | grep ath but it dos not pick up my wifi cards. I have tried many different combination and have been searching this board for the last week. I have re-installed my 3 pogoplugs at least 50 times this week. I can get everything to work with gorgones heavy kernel but atk9 and the linux 2.6 kernel does not support putting the atk9 driver into AP mode.